I was immersed in photographing all the little nuances of a beautiful open magnolia flower when I caught a little movement out of the corner of my eye. 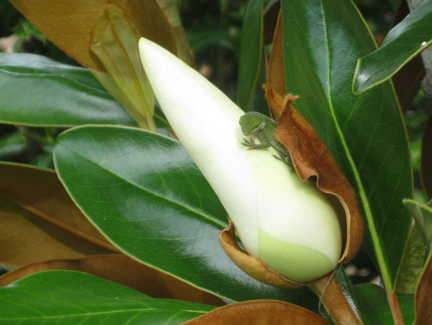 As I looked down I found this little green fellow snuggling into a bud. I tilted my camera as slowly as I could and was able to snap off a few photos before he scurried to deeper cover. Take at the Amrit Yoga Institute in Salt Springs, Florida.